Cool River Coffeehouse opens at 7am every day! With free parking on Breck Main Street until 10am every day, we're an easy stop on your way to work or a day of skiing. We serve both our breakfast and lunch menus all day, or stop in to grab a coffee and something out of our homemade bakery case. Cool River Coffeehouse is located at 325 Main St, Breckenridge Colorado, right behind the Swiss Haven restaurant, along the River Walk, facing the Dredge Restaurant. You can also reach us from F lot by crossing the Blue River next to the Dredge. 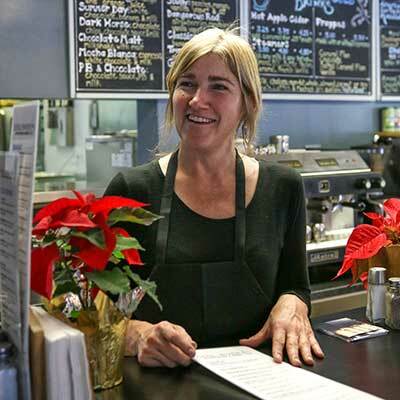 Your favorite Breckenridge coffee house is under new ownership for the 2016/17 ski season! Diane Burris, who managed inxpot in Keystone for 10 years is the proud new owner of Cool River. She has completely redone both the breakfast menu and lunch menu with hip modern dishes that will make your mouth water.